Mad Men finale recap: How has Don and Megan's marriage changed? Mad Men finale recap: How has Don and Megan’s marriage changed? Once Don was in awe of Megan. No more. I wish I’d taken Marie Calvet’s advice and lowered my expectations, but I went into last night hoping for a humdinger of an episode and, like you guys, came out disappointed. I’ll say this, though—there were a couple of great images. As Salon’s Willa Paskin noted on Twitter, the long shot of the SCDP principals surveying their new offices would make a great poster for “the forthcoming Mad Men action hero movie.” I also liked the single-shot sequence of Megan before her commercial shoot. In the tight shot, the scene is almost glamorous, with gaffers running around and make-up artists attending to the star. 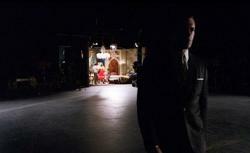 But as Don strides away and the camera dollies back with him, the set becomes smaller and smaller and that glamour quickly fades. This isn’t Samuel Goldwyn Studio; it might be the same soundstage where they filmed those Utz commercials. More problematically for Megan, her own glamour seems to have faded last night. Watching Don watch Megan’s reel, I saw affection, but not awe—and in the past, he’s been awed by her. When she proved herself an unflappable cleaner-up of milkshake spills during last season’s finale. When she expertly salvaged the Heinz account at the client dinner. When she demonstrated her impressive emotional intelligence: counseling against acknowledging Betty’s meddling, to cite just one example this season. Megan was Don’s discovery, and time and again she’s wowed him, reinforcing his belief that he’d found something special. But last night we saw a different Megan. Gone was her cool confidence (compare her tentative screen test to her performance of “Zou Bisou Bisou” 11 episodes ago). Gone was her effortless command of any situation. She needed Don to take care of her and not only that, to put his thumb on the scale and get her a job. Though he ultimately came through for her, I think it disappointed him to do so. “You don’t want it this way,” he told Megan last night, echoing his protest (“We don’t want it that way”) when Pete told him of Jaguar’s indecent proposal. Though Don may not be a paragon of scrupulousness elsewhere, he doesn’t take shortcuts when it comes to his creative. I don’t think he liked seeing Megan compromising herself—and for a measly Butler spot. Remember how Don met Betty? He was writing ad copy for a fur company, and she was one of the models. Now Megan’s modeling for his shoe account, and I couldn’t help but think that the parallel was intentional. Last night, we saw the second Mrs. Draper go from “somebody’s discovery” to “somebody’s wife.” And we know how this particular somebody treats his wives. Julia, I’m with you: I can’t say I’m looking forward to a Season 6 replay of Season 1, with Don trolling the Topaz auditions for talent. But I’m cautiously optimistic that we’ll avoid such a scenario. This series has always found ways to grow and change and surprise us; it’s rarely been caught in a rut. Raise your hand if you predicted that Season 5 would see Roger Sterling drop acid—twice. Or see Pete Campbell take a haymaker to the face—twice! I think we witnessed a significant shift in Don and Megan’s relationship last night. I’m not sure that means that the scene at the bar ended with Don planning, pace R. Kelly, to double up. One element of the Megan plot we haven’t yet discussed is the fact that she totally did her friend from acting class dirty. (Debate rages in the comments about whether the woman who approached Don in the bar was that friend from acting class, but I’m pretty sure it wasn’t.) I imagine their days of leafing through casting calls on the Drapers’ shag carpeting are over once that Butler ad hits the air. That was a cutthroat move worthy of Pete Campbell—I didn’t know Megan had it in her. I suppose it’s a measure of her desperation, and perhaps her creeping suspicion that there’s truth in her mother’s unvarnished assessment of her talents.